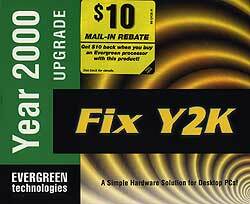 For my first article of this new millennium, I want to tell those of you that have put off their Y2K upgrading and now have a hardware problem with an older computer, that I have found a simple solution. Evergreen Technology makes a board ( Fix Y2K - Year 2000 Upgrade ) that very simply takes control of your PC (much like older PC hard disk controllers) during the boot process and makes sure your clock displays the proper year and CENTURY. Since it works from a hardware level, it is compatible with DOS, Windows 3.1, Windows 95 and Windows 98. Installation is a snap - Open your computer, place the Evergreen card in an empty ISA slot then close your computer - that's it. In fact, the only way to tell if this card is running is to watch for the Millennium message, after your BIOS "startup" screen. The only problem I had after installation is that Windows 95 did not shut down properly. (The orange "You may now turn off your computer" screen never appeared.) After a call to their very capable technical support personnel, they had me change one of the jumpers (the FIRST, leftmost one) and remove it. This changes the I/O port of the board and after this change, Windows 95 was happy and shut down properly. So, if you have found a machine you forget to fix and need to get it up and running quickly, here is a very simple solution that I highly recommend.